Since it’s arrival, our team of developers and UX experts have been looking thoroughly at the technology evaluating how we can bring our customers the most value from employing SharePoint’s modern experiences as part of their digital workplace. From version 6.31 of Wizdom, and onwards!, the Wizdom product supports SharePoint’s modern experiences with a solution that bridges the worlds of classic and modern SharePoint into one coherent, future-proof digital workplace. As you have probably heard and perhaps even seen, modern sites and pages are beautiful and fast performing. However, modern SharePoint does not offer a global and governed navigation across sites and areas. Also, there is simply no solution for a navigation that unites the modern and classic world. If you build content with modern pages, this content will be completely isolated from the content on your classic SharePoint intranet. 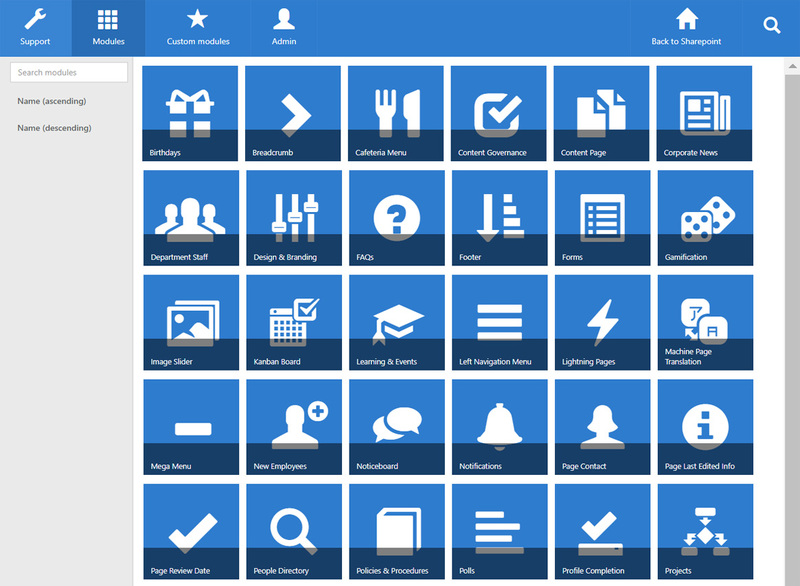 Without sacrificing any functionality, from this version, the Wizdom Mega Menu can be enabled on modern sites too. Preparing the Mega Menu to span across classic and modern sites has been a top priority. 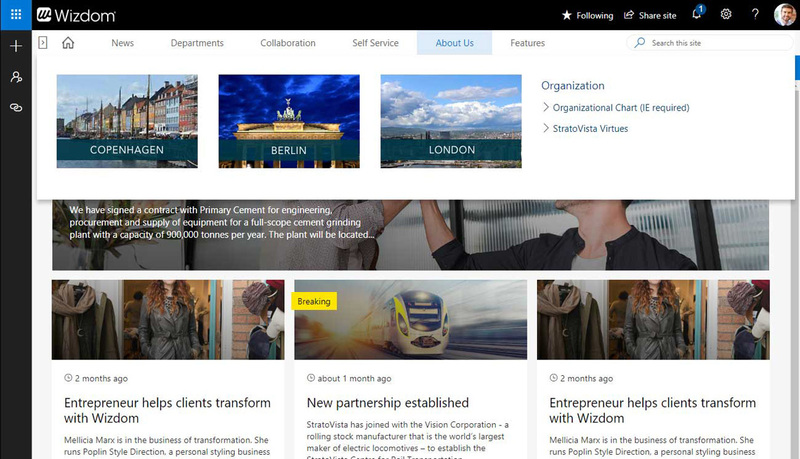 This allows you to fully integrate modern content into your classic SharePoint intranet. Users can use the global navigation to go back and forth between classic and modern pages and maintain the feeling of moving around in one coherent, digital environment. Administering a Wizdom intranet that includes both classic and modern SharePoint sites shouldn’t mean double work. All modules in Wizdom, whether used on classic or modern SharePoint pages, are still administered in Wizdom Configuration Center. There might be a few separate module settings for classic and modern sites, but, again, it’s all configured in the same place, in the way you’re familiar with. Wizdom Corporate News web part has been updated to collect and display news articles from both classic and modern sites. This means you can offer users one news center that will present the collected feed of relevant corporate news, no matter where on your digital workplace these news articles reside. To keep your intranet personalized and help users quickly find what they need we’ve enabled Wizdom’s content targeting mechanism for the modern experiences. Using the Mega Menu, you can still offer user’s a navigation that matches their location, position, and interests. Targeting of news to a specific subset of employees is, of course, possible with the Corporate News and the Noticeboard module. Providing users a set of personal links, that provide access to the tools and resources that only they need, can be done with the Quicklinks web part and the Service Menu. Wizdom’s notifications mechanism allows for personal notifications to all users. This all make up for the modern experiences’ current lack of a solution for content targeting. 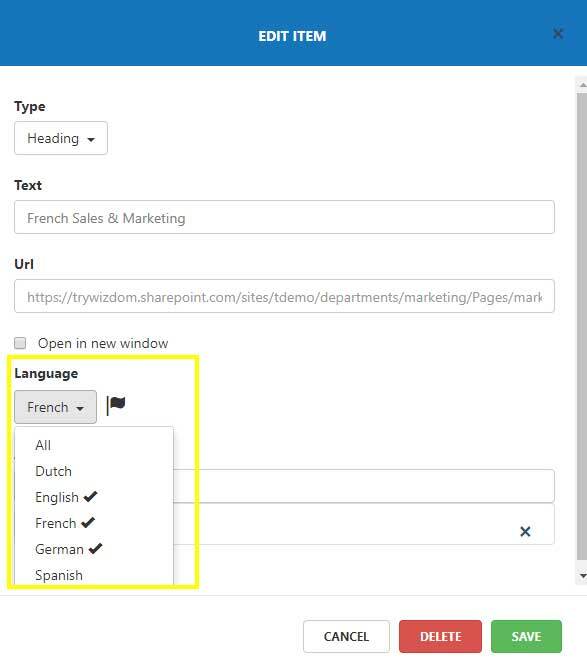 Would you like to offer users in your multilingual organization the new modern experiences of SharePoint? And still allow each user to read content in the language he or she prefers? With the content targeting mechanism of Wizdom comes the possibility to, also, support a multilingual intranet. Use the Mega Menu’s features to create a global navigation with content that adapts to the preferred language of the user. Soon, all Wizdom’s features and functions will be available for SharePoint’s modern experiences. With this version, we have the first pack of Wizdom modules ready. As they live in the modern environment, the user experience of Wizdom’s web parts will be slightly different here. However, the modules for modern SharePoint will include the same functionality as they do for the classic version, now and onwards. Cross site features: the Mega Menu, custom branding, Service Menu, site creation function. Web parts: Corporate News, Noticeboard, Policies I Must Read, People Directory, Quicklinks, Cafeteria Menu. As written, you configure modules for the modern experiences exactly as you’re used to configure them for the classic experiences. All Wizdom modules, whether they’re used for classic or modern, just have one module administration. The settings performed here will apply to the module on classic as well as modern sites. Administration of the web parts for the modern experiences differs slightly, as web parts are configured differently in SharePoint’s modern experiences. Administration of the web parts for the modern experiences will be thoroughly documented.